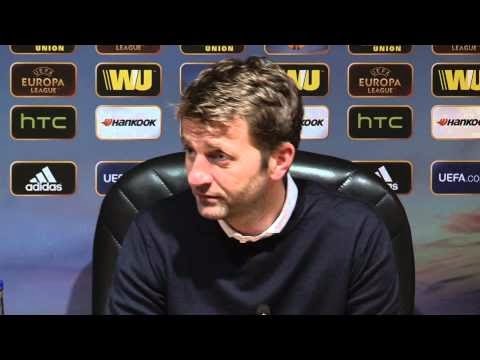 Home » Tim Sherwood » Is Sherwood's position untenable? The speculation continues with Tottenham having to deny any contact with clubs to stay the right side of the law and the press suggesting all sorts of people to take over. This is exactly the situation Daniel Levy tried to avoid by giving Sherwood an 18 month contract. However as soon as the press, and they took their time, cottoned on to the fact it was only ever an interim appointment then the speculation began and Sherwood finds himself in an intolerable position. Rafa Benitez had to endure it and Chelsea and now Sherwood at Spurs, it is not pleasant. Tim Sherwood is clearly an intelligent footballing man and his views are pretty much on the mark. We do have a shallow bunch of professionals who should be embarrassed with themselves, but now he has found a team who fight and by leaving players out he has forced them to fight for a place. He was once again asked about his position as he is at every press conference, what the press expect him to tell them goodness knows. The whole matter is not being handled very well. "I'm not sure if it makes it untenable. We play West Ham and then we play at home to Aston Villa. "After that I will sit down with the chairman and we'll decide what the plan is moving forward. And then we'll see if it's untenable or not. "It was a strange situation, when a club has come out and said they've been spoken to and so has the manager and the club that I am working for is coming out and denying it. "That's where we are with it and I'm no further forward with that. The people upstairs will know whether I'm good enough to take on this club and if I'm the person they want to take on this club. The next two games won't make any difference." "I don't think he is too interested in what I'm doing already because if he did he will see that he has got a hard act to follow." That refers to the fact Spurs would be above Arsenal in 4th if the season started at his his appointment which for all the moaning about him is a bloody good achievement for which he deserves credit, not abuse. It's better than his predecessor was doing. He was asked if he should be treated with more respect, which of course he should, but he refused to be drawn on that. "That's for other people to decide. It's something I've been used to be dealing with since I came into the job. What am I going to do? I'm not going to roll up and die, I'm just going to get on with my job which is to try and prepare the team to win football matches. "Whatever will be, will be at the end of that. I've just got to carry on with my business, show my personal pride and professionalism, and make sure that the lads are prepared to win for the team, for the fans and for this great club. "What will happen at the end of the season? Who knows?" Tottenham will have a shortlist at the end of the season and Sherwood will be one of the names on that list. He will meet with Daniel Levy as will Frank de Boer if Spurs are given permission to talk to him which seems likely. The fact that Sherwood would have Spurs sitting 4th right now rather rules out him going back to his old job, the offer for which is on the table. Who knows if something else can be worked out, another twist and a decision to stay and work with De Boer is unlikely. 0 Response to "Is Sherwood's position untenable?"